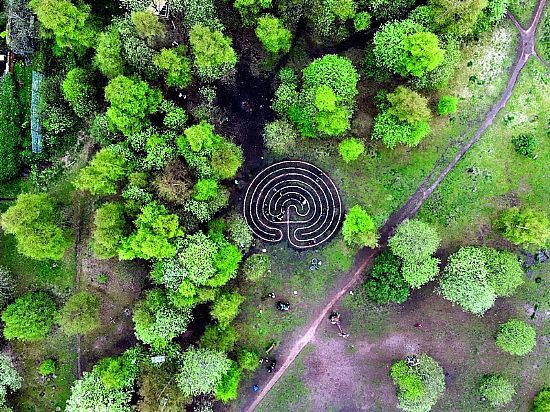 The Children's Wood North Kelvin Meadow Labyrinth is the realsiation of a long-held vision to bring a public labyrinth to Glasgow, for the benefit and enjoyment the local community and visitors alike. The labyrinth invites an inner ritual journey from everyday reality into a world of peace and stillness, creating a unique place for reconnecting with ourselves and with Nature. A labyrinth brings an oasis of tranquillity to the busiest of settings and benefits all sections of the community, including children and young people, the elderly and people with mental and physical health problems, as well as anyone looking for greater peace, insight and balance in their life. Why a labyrinth for Glasgow? Walking the labyrinth allows you to leave the noise and busyness of the everyday world behind, as you weave towards the centre; an opportunity to pause and experience a place of stillness and contemplation. As the journey continues outwards, you have chance to integrate new found insights, intentions and energy. Walking the labyrinth is an accessible, fun and powerful way to connect with Nature, to gain insight and inspiration, and to experience a sense of tranquillity. Labyrinths enhance the health and well-being of individuals, communities and the environment. Read more at The Benefits of the Labyrinth. More information on the making of the labyrinth and future events coming shortly!